VATICAN CITY (CNS) — Taking the helm of the Pontifical Council for Justice and Peace in 2009, near the beginning of the global financial crisis, Ghanaian Cardinal Peter Turkson’s work has focused heavily on promoting Pope Benedict XVI’s calls for more carefully regulated international markets and for real solidarity with the poor. The 64-year-old former archbishop of Cape Coast, Ghana, also continued his longtime defense of Catholic teaching on the family while highlighting the connection between strong families and strong, peaceful societies. When observers look at leaders from the church in Africa, Cardinal Turkson’s name usually rises to the top because of his long experience as head of a diocese combined with his more recent experience in the Roman Curia. A trained Scripture scholar, he was named to the College of Cardinals by Blessed John Paul II in 2003. In Ghana, where Catholics made up only 12 percent of the population, the cardinal was active in interreligious dialogue, particularly with Muslims. But Cardinal Turkson created an uproar and provoked several days of debate and discussion during the October Synod of Bishops on the new evangelization when he asked synod officials to play an anonymous YouTube video purporting to demonstrate how, demographically, Islam would become the predominant religion in Europe. In his main address to the synod, Cardinal Turkson spoke of the evangelizing power of the church’s work to promote justice and peace and to aid to the poor and suffering. Defending people’s dignity and rights is part of the church’s obligation to love them as Jesus did, he said, but it’s also an area where the church is most attractive to many people today. “Many people today are increasingly sensitive to questions regarding human rights, justice, equality, the battle against poverty — themes that touch the concrete lives of individuals and nations. This reality can be an authentic opportunity for new evangelization,” he said. Cardinal Turkson also made the news in 2011 when, under his leadership, the justice and peace council published a 41-page reflection on the economic crisis and on both practical and ethical measures needed to avoid similar worldwide crises in the future. Among other things, the text — “Toward Reforming the International Financial and Monetary Systems in the Context of Global Public Authority” — proposed a “central world bank” to regulate the flow of monetary exchanges, and taxation on financial transactions to aid the economies of poorer countries. The document said the global financial crisis unveiled “selfishness, collective greed and the hoarding of goods on a great scale,” and said a supranational authority was needed to place the common good at the center of international economic activity. Born Oct. 11, 1948, he studied in Ghana at St. Teresa’s Minor Seminary in Elmina and St. Peter’s Regional Seminary in Cape Coast before attending St. Anthony-on-Hudson Seminary in Rensselaer, New York, a Franciscan-run seminary that has since closed. While at the New York seminary, he spent a summer studying at the State University of New York at Albany. Ordained a priest in 1975, he earned a licentiate and a doctorate in sacred Scriptures at the Pontifical Biblical Institute. 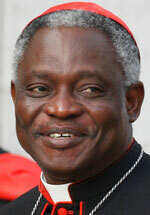 He was named archbishop of Cape Coast in 1992, at the age of 43. Oh, boy, A Cardinal that promotes Justice and Peace – and he talks to Muslims. What would Bill Donohue from the Catholic League have to say/rant about that choice?? ?